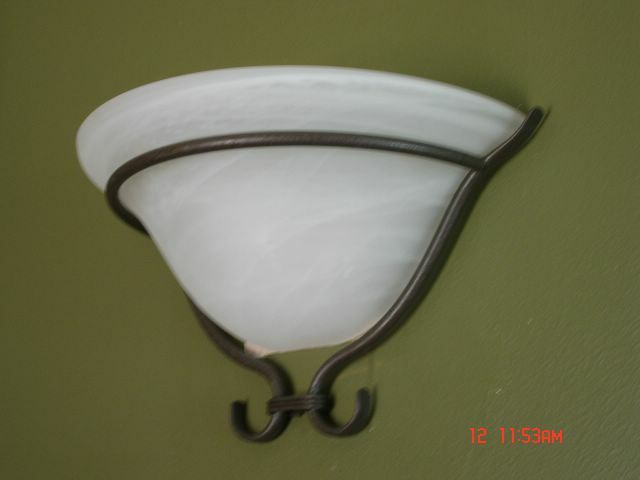 One very simple home improvement project is to change out your light fixtures. The most important thing to remember when doing this type of home improvement project is to TURN OFF THE ELECTRICITY!!! I can't stress this aspect of the project enough. My husband once got a little too cocky in his home improvement expertise and decided to change out my sister's chandalier without turning it off. The only thing that saved him from SEVERE electric shock is that he hooked up the ground wire first. When he hooked up the last wire, he completed the circut and electrocuted himself. He was out of it for the rest of the day. Back to changing out a light fixture. It's so easy and inexpensive and you'll be so proud of yourself when you complete your first light that you'll have the whole house re-lit by the end of the day! Connect each wire in the light to it's respective wire in the wall. Black goes to black, white goes to white and the ground gets tucked around a little screw on the wall plate. Then all you have to do to complete this easy home improvement project is screw the light up on the wall and turn the electricity back on. Ta-da! You have a brand-spanking new light in 15 minutes or less. Don't forget to put in a bulb! My home after ALOT of work.